Last month, I led a storytelling workshop for women, where we talked, ate, and shared narratives about issues of displacement, the state of being transnational, and the loss one faces when attempting to come to terms with being in-between. The workshop culminated yesterday at Houston Public Library’s second floor. Participants Sukhada Tatke and Azeb Yusuf shared their own stories and read narratives by Zema Kelleta, Tanya Jackson, Muna Tamang. 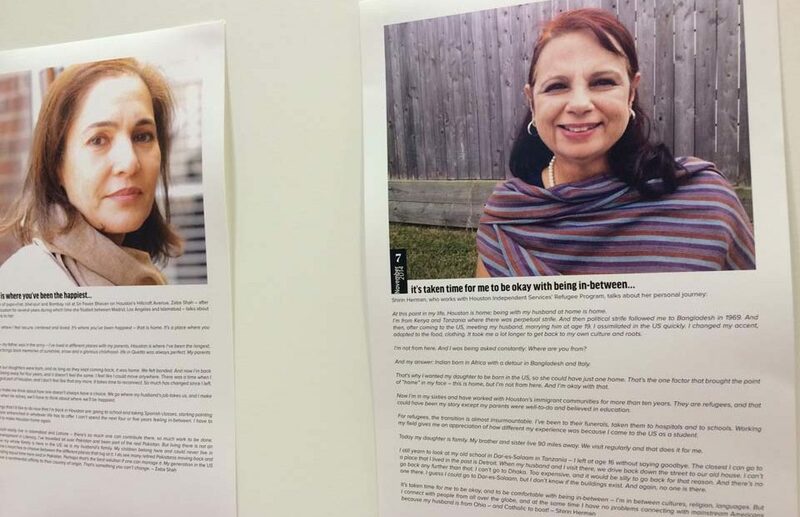 Additionally, Purnima and Hemangi, students who participated in my spring 2015 workshops, performed their stories that were published in Voices Breaking Boundaries’ Borderlines Volume 2. I also read an excerpt, “Skyping My Father Goodbye” from my memoir-in-progress, one that was published in Houston’ Chronicle’s Gray Matters column. For the reading, I installed images from my blog that will be on view at the library until December 29, 2015. I conducted and posted the interviews during 2014-15 as one of the projects for my Mid-America Arts Alliance Artistic Innovations grant.